Refilled Nests: Is the e-world to blame for the stampede home? Or is it simply demographics? The Census report is in: A higher percentage of young adults have been living with their parents in 2015 than during the recession. Despite widespread expectations, our refilled-nests are not emptying out as quickly and thoroughly as they did a generation ago. (The share of 18-34 year-olds living with parents was 31.5% in 2015, up from 31.4% in 2014.) Major blips in the economy, the difficulty in landing career jobs and the burden of student debt. Those are the usual reasons behind the current trend: a trend that some see as the new normal. There are additional, counter-intuitive reasons. One is the imbalance in young millennials' lives between offline and online worlds. The youngest millennials are the first generation to grow up as dual citizens or, as Carl Pickhardt,puts it, "Two-worlders." That is they have, since infancy, learned to live in the overlapping and interconnected worlds of offline and online realities. Pickhardt, a psychologist who specializes in dealing with adolescents and young adults, writes that "Since birth they have inhabited the smaller Interpersonal actual world where communication and interaction are directly conducted, and the vast virtual Internet world where communication and interaction are electronically mediated." He suggests that they are having a hard time balancing one against the other. Their computers are an auxiliary brain--an electronic enabler that serves a multitude of functions --information retrieval, communication, social networking, entertainment, shopping, creative expression, and problem solving. "It is an integral part of a millennial young person’s functioning, and that isn’t going to change," Pickhardt writes. In consequence of our children growing up in these two worlds, parenting has become more than doubly complicated. We have to help our kids keep the two worlds adequately separated, adequately integrated, and adequately balanced. What's that got to do with millennials living at home in greater numbers than usual? It may be that online escape or reliance has come at the experience of offline education and experience. As Pickhardt sees it, "it might be that much of the hard work of growing up (building practical offline skills, problem solving offline experience, assuming offline responsibilities) requires laboring in the fields of relatively unglamorous and comparatively boring offline life. In this way, they may have slowed down the development of functional independence." Thus some millennials may choose to live a while longer at home where they can continue to be sheltered and defer self-support and direction. They may need more offline time and practice before feeling ready to move out and live independently. Perhaps it just takes longer to grow up in two worlds than it used to in one. Maybe learning adequate separation, integration, and balance required by today's dual citizenship just takes more time. If this is so, the new normal may be here to stay. We might not want to convert their bedrooms to our own private dens quite yet. There's another reason to keep those rooms available. "The increase in young adults living with parents over the past twenty years can be explained entirely by demographic changes. The increase since 2005 is not an aberration; once demographics are taken into account, the aberration is the bubble years of the mid-2000s, when an unusually low share of young adults was living with parents." 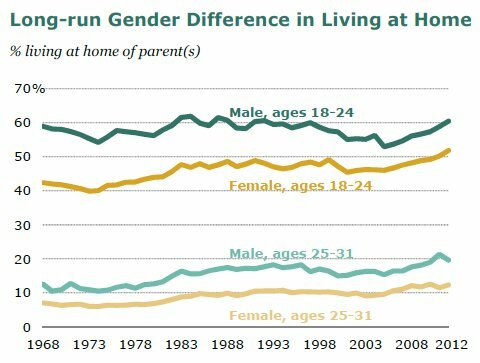 "Unless demographic trends reverse, the share of young adults living with parents is unlikely to fall much. Today’s millennials will leave their parents’ homes as they age — they’re not going to live there forever. But it won’t be the sudden unleashing of pent-up demand we might have expected if the increase of living with parents were only about the housing bust and recession and not about longer-term demographic shifts." It isn't all logarithms and higher-math analysis at Goldman Sachs. The investment firm's researchers have their soft side. Two economists there looked into the question of, as they framed it, "What's Keeping the Kids at Their Parents' Homes?" Statistically speaking, they are there in greater numbers than they were post-recession. Between 2010 and this past spring, the share of young adults living in their parents' homes increased from 24 percent to 26, according to a Pew study--even though the economy improved during that time. 3--Rent-to-income ratios are at historic highs, especially for young people. According to GS economists, "the future trajectory of these three factors is less clear, suggesting that the share of 18-34 year-olds living at home might not fully return to pre-recession rates." GS concludes that this is not bad news if you're a home builder. There's a big bulge of adults living at home that will move out and into homes of their own--in a little while. Extending that logic: If you're a parent with a basement full of returnees, the end is in sight--but not right away. Some of us go with the flow when our grown kids move home with us--especially if they're recent graduates and are trying to gain footing in the work world. A neighbor whose son went to cooking school (to study the glorious culinary arts) loves having his son at home: When the son cooks dinner--and he does so a few times a week--the meals are sensational. But more of us find the experience frustrating: too up-close with adolescent habits they have yet to shed and with adult ways we're not ready to deal with. For some of us, the experience is financially draining: We're spending money on our adult children that we should be squirreling away for retirement. That is the point Barbara Torris makes in her blog Retire In Style. She has proposed a solution: downsize. Sell [or rent] the house you brought you kids up in and move into something smaller that doesn't necessarily have room for an extra grown up. "Many mid-life and retired people are downsizing so that, when the children need help, coming home to live will not be a choice. They know it would not be a happy situation for them. Interesting huh? "Could it be people are saving enough money by downsizing so they are able to help children in trouble but not make them dependent on them totally? The family remains on good terms and the children continue to mature and be self reliant. Helping pay part of the grown child's rent is a lot different than them coming home to live rent-free. The child could still be responsible for most of the cost and be forced to live within their means." Just throwing the idea out there, as was RetireInStyle. In case you're wondering who--daughters? sons?--is boomeranging back home, there's this recent finding from Pew Research. Pew Research Center Notes: “Living at home” refers to an adult who is the child or stepchild of the head of the household, regardless of the adult’s marital status. Source: Pew Research Center tabulations of March 2012 Current Population Survey Integrated Public Use Micro Sample. Money Matters:Our grown kids' financial struggles are tougher than ours were at their age. When Parents Throw a Boomerang! They're launched. They've finished college and are ready to set out into the world. We've brought them up to be independent, thoughtful individuals, of course. But they still may be babes in the woods when it comes to making the day-today financial decisions they face in their first few post-college years. Sometimes it helps to have words of advice come from a third party--as opposed to the doting parents themselves. 1. Build your credit history slowly and steadily by opening up accounts in your own name and paying them off on time. 2. Instead of using the first paycheck to make upgrade the lifestyle--new 60-inch TV, new sofa--spread out purchases over time and start with necessities, like a bed. 3. Start saving at least one-quarterof income for future goals, including retirement. The first priority is to establish an emergency savings accoung with at least three months' worth of expenses . If the employer offers any type of 401k matching program, take advantage of it—passing it up is like saying no to a pay increase. Then open an after-tax savings account for other goals, from traveling to homeownership. 4. Even in this economy, employers expect some haggling over salary and benefits. A simple request after expressing enthusiasm and appreciation for the job offer can lead to hundreds of thousands of dollars more in lifetime earnings or better benefits. 5. There's no avoiding the fact that being an adult comes with some secretarial duties. Suddenly, there are pay stubs, health insurance forms, tax documents, and credit card statements to keep organized. Take advantage of modern technology by going paperless whenever possible. Online accounts are easier to manage; websites such as shoeboxed.com keep receipts organized online, which is especially helpful at tax time. Mint.com makes it easy to track spending and establish a budget. 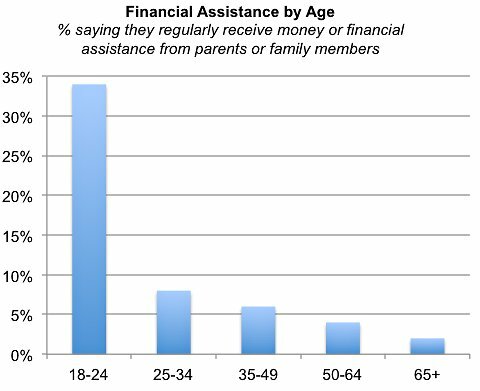 Yet another confirmation of what many of us know: We are the generation that offers our grown children financial help. Pew Research Center's latest poll finds that one in 10 American adults receive money or financial assistance from their parents or other family members. The bulk of those receiving help are emerging adults--men and women in the 18 to 24 year old range. It falls off from there but doesn't stop--some of us are still getting help from our parents. Based on telephone interviews conducted Dec. 6 to 19, 2011, with a nationally representative sample of 2,048 adults ages 18 and older. Re-Nesting: Boomerang kids like living with us. A poll tells all. They're back. And they like the living conditions. According to a recent Pew Research Center poll, 68% of young adults ages 18 to 34 who are living with their parents or have moved back in temporarily because of economic conditions say they are very satisfied with their family life. (Roughly a similar proportion--73%--who are not living with their parents are equally satisfied.). Similarly, 44% of young adults who live with their parents say they are very satisfied with their present housing situation, while 49% who live on their own say the same. The Pew survey had more to say about the circumstances of young adults (18 to 34 years old) who've come home to re-nest. They are less likely than their counterparts who are living on their own to say they have enough money to live the kind of life they want. It's 21% of those living at home who say they have enough money now; 38% of those who are not living with their parents. Not only are they satisfied, they're looking to the future with optimism. Says the Pew poll: "Living with mom and dad hasn’t dampened the economic optimism of these young adults. Overall, young adults are much more optimistic than middle-aged and older adults about their financial future, in spite of the tough economic times and difficult labor market they are facing." As for 'We the Parents', the poll finds we're just as satisfied with our family life and housing situation as are those parents whose adult children have not moved back home. The kids, they're pretty satisfied with their relationship with us. Here's the 'loving relationship' breakdown in chart form. After her 37-year-old (and single) daughter lost her job, a friend had a new roomer for six months. No surprise there: A 2009 survey by the Pew Research Center reports that 13 percent of parents with grown children say one of their adult kids has moved back home in the past year--much of that thanks to tough economic times. Before this mom's out-of-work daughter moved in, though, the mother set some rules. No, they weren't about who would wash the dishes or whether rent would be paid. Instead, the mom emailed me the following dictum she asked her daughter to abide by: "You will not talk to me about what I eat or what I wear (my hot buttons) and in return I will not ask you where you are going and when you’ll be back. I will not expect you to show up for dinner (a good thing, as I don’t cook)." The simple rules worked well on both sides. The daughter kept her side of the bargain and more: Even though she wasn't expected to, she usually called to let her mother know where she was and when she would be back. As for the mom, she once asked her daughter who it was she was talking to on the phone. "I was told, 'None of your business.' I have never done that again!" At the end of the "visit," both mother and daughter agreed that living together again had been really hard but that the understanding of what the ground rules were helped. A lot of articles I read on the subject of re-nesting--of boomerang children moving back home after living independently--list a host of rules to follow: set clear expectations regarding expenses and household chores; set a time limit; charge rent. And key to it all: Write it all out in an agreement. This is good, solid advice. Practical. Sound. But, frankly, if one of my children were moving back home, I can't see myself doing it. There would be so much emotional overload and this would just add to it. It makes more sense to put your finger on the hot buttons--we all know what ours and our children's are, or at least we should--and make an agreement to steer clear of them. Not stepping on each others toes is never easy. But at least spelling out what it is you would find most difficult for a long or short co-habitation is a start. And it probably has very little to do with how much rent they will or will not pay--unless money is one of the hot buttons.